Do you ever wonder who made the discovery that carrots and baked goods taste delicious together? I mean, carrots aren’t the most flavorful things in the world. Unless they’re drenched in Ranch dressing. But when thrown into some cake batter? YUM. Carrot cake is one of my favorite cakes on the planet..
I’m not sure when or how my apple obsession started, but it’s severe. Apples and I, we are an unstoppable force this time of year. I posted my delicious Apple Crisp recipe a really long, long time ago and realized it needed an update. I recently shared my favorite Blueberry Muffin recipe with you, but this new recipe with blueberries and peaches takes the whole muffin situation to a new level of delicious. This is the perfect snack or breakfast when peaches are in season! A day late and a dollar short with this one. Actually, that would be two days late, but who's counting? Saturday was Cinco de Mayo, which is always provides a fun reason to eat Mexican food and drink tequila. Mmm, Mexican food and tequila.. On my Facebook baking group.. The massive piles of snow outside are confusing. And depressing. So I keep telling myself that it's January. Because these things are expected in January. So here you go...here's a yummy and easy side dish for you to enjoy with your next January meal! My shivering fingers are here to quickly get some work done, which will be followed by packing for a kidless weekend away. Too bad we're not heading somewhere warm (still love ya, Chicago!). So let's talk cookies! What are your favorite kinds of cookies to bake..
Hosting our first Thanksgiving is in the books! Everything went off without a hitch. The food and company were all incredible. I hope your Thanksgiving was packed with amazing things, as well! One of the fun little touches I added to our day was..
At what point do I rename this website to reflect my obsession with all things apple? Actually, this might be my last apple-related post for a while. There are too many other recipes that need to be made, eaten and shared. Plus, can you believe Thanksgiving is coming up so quickly? I don't know what is going on with me. I haven't been this obsessed with apples, or any food for that matter, ever. The last ten or twelve apples from our recent orchard outing screamed at me today: Use me! I ran them through our juicer and after taking six huge gulps of fresh apple juice (SO DELICIOUS! ), I turned the rest into a spiced cider. I will not complain about the weather, I will not complain about the weather, I will not complain about the weather. Instead I will talk about things that make me happy, like the fact that we have over NINETY Pillow Pets in our house for the kids at Children's Hospital. NINETY! All thanks to the generosity of friends, family and people I have never met! I cannot think about this delicious monkey bread without also thinking about my good friend Laurie (who I occasionally call Larry). Larry and I have much in common. Every time I see her, which is not often, I am reminded how much I adore her. I love that girl. Oh how I wish I could talk her into moving to Minnesota! While my boys and I were in North Carolina visiting family a few weeks ago, I did a search for a quick (no yeast) cinnamon roll recipe to make for breakfast one morning. These delicious-looking rolls popped up from Young Married Chic. Mostly I wanted quick, but was hoping for delicious, too. 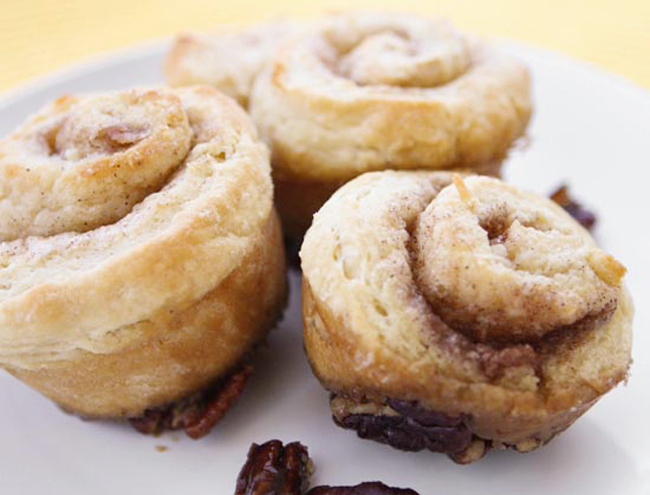 This Pecan-Maple Sticky Rolls recipe is the perfect addition to your breakfast or brunch. They have a chewy bite to them filled with cinnamon and maple sweetness. Skip the run to the bakery, these rolls are easy to make right in your own kitchen! This is Week #36 of my 2011 cooking challenge! Click here to view all recipes from this challenge. All recipes created for this challenge come from the Food and Wine Annual Cookbook 2010: An Entire Year of Recipes. This week has been a nutty one, so it has not the best week to be behind in cooking and blogging. Somehow, I'm managing to get things accomplished. And thankfully, these sticky rolls, much like my last recipe, were easy to make. I have never made sticky rolls quite like these. They are filled with comforting deliciousness, which suits this cool fall weather nicely. I loved them. Everyone in my family loved them. To begin, preheat your oven to 425 degrees F. Spread 3/4 cup whole pecans in a pie plate and toast in the oven for about 6 minutes, or until fragrant. Set aside. Add 1 stick of cubed, chilled butter to the the flour mixture and pulse until it becomes the size of small peas. Add 1 cup of buttermilk and pulse a few times, just until a soft dough forms. Turn the dough out onto a floured surface and knead 3 times. Pat or roll the dough into an 8x12-inch rectangle. Brush with 2 tablespoons of melted butter. Sprinkle the mixture evenly over the dough. My cute flour-duster and dough-shaper. Beginning at a long side, roll the dough into a tight cylinder. Pinch the seam closed and cut the dough into 12 slices. Divide the syrup-butter mixture among the muffin cups. Scatter the toasted pecans in the cups. Top with the dough pinwheels. Bake in the preheated oven for 18 minutes, or until golden brown. Place a rack over the rolls and invert them onto the rack. Replace any pecans that get stuck in the cups and let cool for 5 minutes before serving. Preheat the oven to 425 degrees F. Spread the pecans in a pie plate and toast for about 6 minutes, until fragrant; let cool slightly. Meanwhile, spray a 12-cup muffin tin with cooking spray. 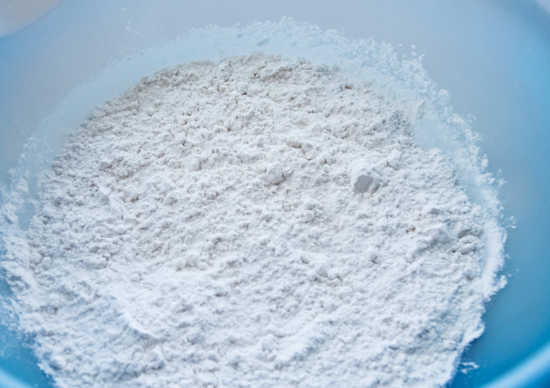 In a food processor, pulse the 2 cups of flour with 2 tablespoons of the sugar, the baking powder, baking soda and salt. Add the cubed butter and pulse until it is the size of small peas. Add the buttermilk and pulse a few times, just until a soft dough forms. Turn the dough out onto a floured surface and knead 3 times. Pat or roll the dough into an 8x12-inch rectangle. Brush with 2 tablespoons of the melted butter. 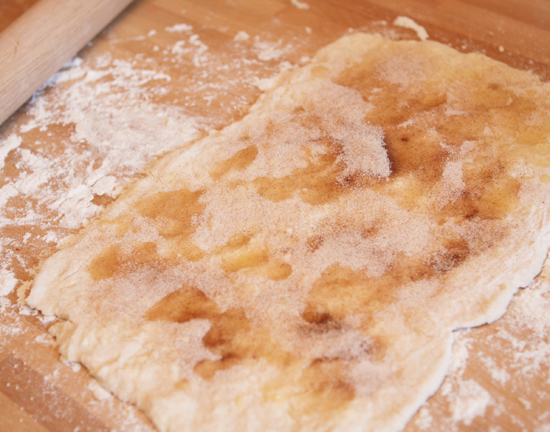 In a small bowl, combine the remaining 2 tablespoons of sugar with the cinnamon and sprinkle all over the dough. Beginning at a long side, roll the dough into a tight cylinder and pinch the seam closed. Cut the dough into 12 slices. Divide the maple syrup and the remaining 2 tablespoons of melted butter among the cups. Scatter the pecans in the cups and top with the dough pinwheels. Bake for about 18 minutes, until golden; place a baking sheet below to catch any drips. Invert a rack over the rolls and invert them onto the rack. Replace any pecans that get stuck in the cups and let cool for 5 minutes before serving. 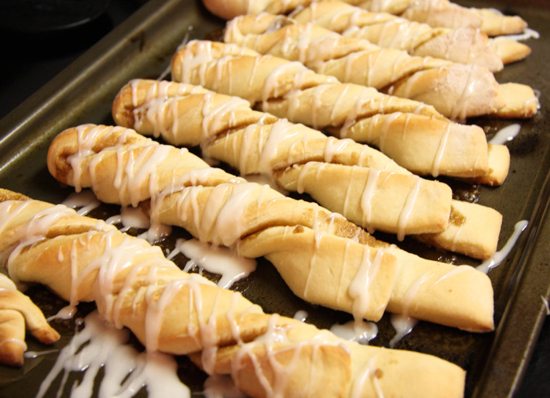 Sugary, cinnamony, frosting-laden deliciousness in a simple Cinnamon Twists recipe. Bursting with cinnamon and sweetness, you’ll never be able to eat just one. These tender, flaky treats are often found at restaurants but you can make them yourself and even freeze some for later! Oh goodness, these cinnamon twists are good. Sugary, cinnamony, frosting-laden deliciousness. I made them as a middle-of-the-day treat, but they would also be great for breakfast or dessert or a midnight snack or a side dish to chicken. There is truly no wrong time or place to consume them. They do take a while to make since the dough needs to rise for a couple hours, so plan ahead! Start out by grabbing a large bowl. Stir until the mixture is warm and until the butter has almost melted. Add this to the flour mixture. Do you see the cute pipe-smoking guy? Beat with an electric mixer on low to medium speed for 30 seconds, while constantly scraping the side of the bowl with a rubber spatula. Beat on high speed for 3 more minutes. Add 2 1/2 more cups of flour. Stir it all together. It would be easiest to use a wooden spoon for this part, I imagine. My wooden spoon has mysteriously gone missing (Elijah! ), so I can't tell you this for certain. 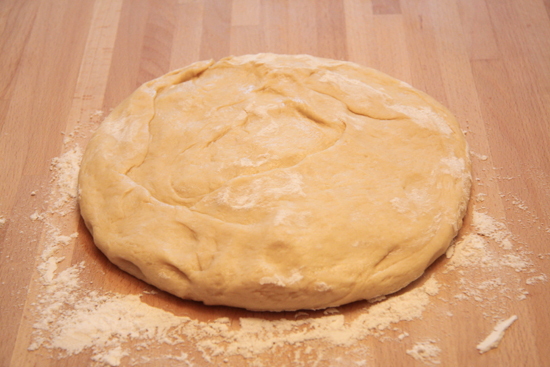 Place dough on a flat, floured surface. Knead in enough flour to make a moderately soft dough that is smooth and elastic. This takes between 3 and 5 minutes of kneading. Shape it into a ball. 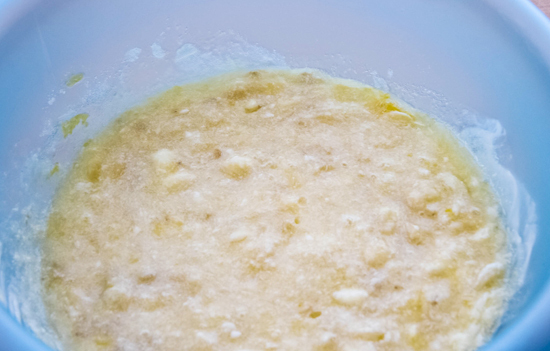 Place the ball of dough in a lightly greased bowl, turning it once so the entire surface is greased. Cover and let it rise in a warm place until it doubles in size. This takes about 2 hours. While you wait take some time to check out some of my other favorite snack foods. Fudgy Cream Cheese Rolls have got to be a close second in our family! Punch dough down and place onto a lightly floured surface. Cover and allow it to rest for 10 minutes. While your tired dough is resting, melt 1/4 cup of butter in a small saucepan over low heat. Mix well and allow the mixture to cool. With a rolling pin, roll the dough out into a rectangle (or oval; hey, it's not easy to roll dough into the shape of a rectangle!). The dough should be between 1/4 inch and 1/2 inch in thickness. Spread the butter-brown-sugar mixture over the dough. It does not have to be even. Cut the dough crosswise into 1-inch strips. Fold each strip in half, end to end, and twist several times. Arrange the twists on 2 parchment-lined baking sheets or on 2 lightly greased baking sheets. Cover and allow them to rise for 45 more minutes. Now would be a good time to preheat your oven to 375 degrees F.
Drizzle the frosting over the twists when they are still warm. My two oldest boys were out playing in the snow when I finished these, so only Sammy was around to witness my unabashed indulging. Incredible! Contributed by Megan Porta from pipandebby.com (Source: Christmas Baking 2010 Magazine). In a small saucepan stir the following ingredients together over medium heat: 3/4 cup milk, 1/2 cup sugar, 1/3 cup butter, 1 teaspoon salt. 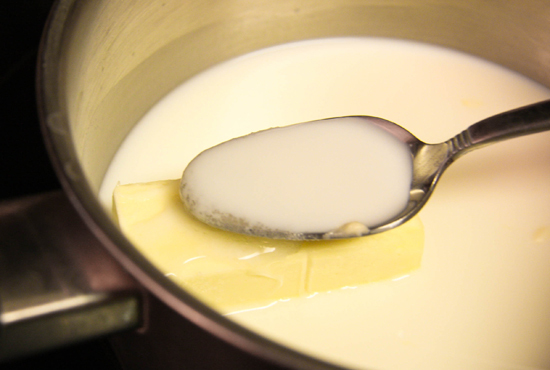 Stir until the mixture is warm and until the butter has almost melted. Add this to the flour mixture. Add 2 eggs and beat with an electric mixer on low to medium speed for 30 seconds, while constantly scraping the side of the bowl with a rubber spatula. Beat on high speed for 3 minutes. Add 2 1/2 more cups of flour and stir it all together. 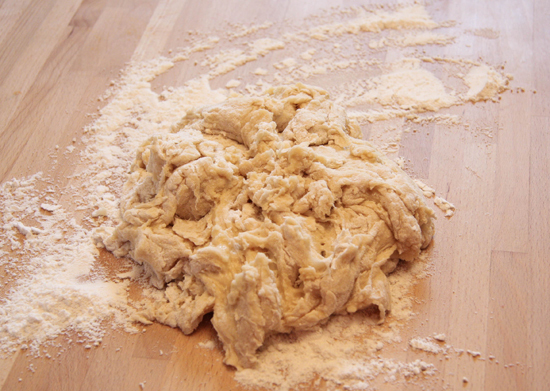 Place dough on a flat, floured surface. Knead in enough flour to make a moderately soft dough. This takes approximately 3 to 5 minutes of kneading. Shape into a ball. 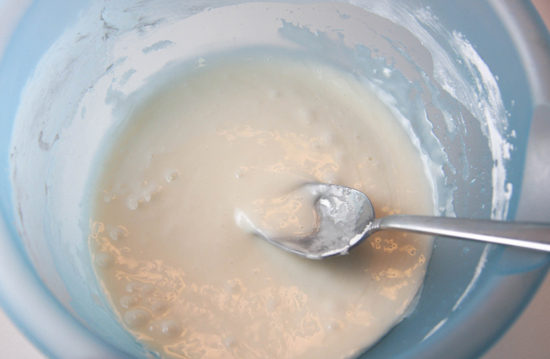 Place the ball of dough in a lightly greases bowl, turning it once so the entire surface is greased. Cover and let rise in a warm place until it doubles in size. This takes about 2 hours. Punch dough down and place onto a lightly floured surface. Cover and allow it to rest for 10 minutes. While the dough is resting, melt 1/4 cup of butter in a small saucepan over low heat. Add: 2/3 cup brown sugar, 1 teaspoon cinnamon. Mix well and allow the mixture to cool. 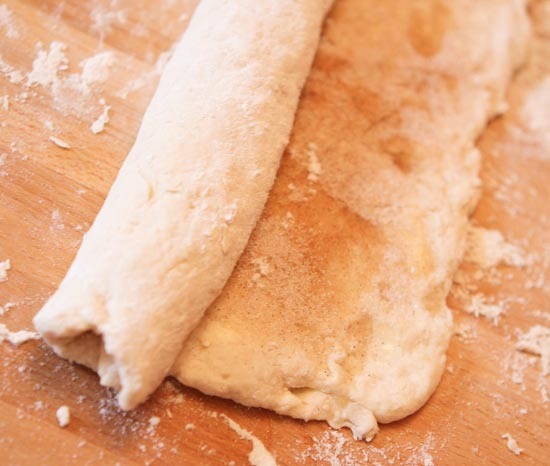 With a rolling pin, roll the dough into a rectangle. The dough should be between 1/4 inch and 1/2 inch in thickness. 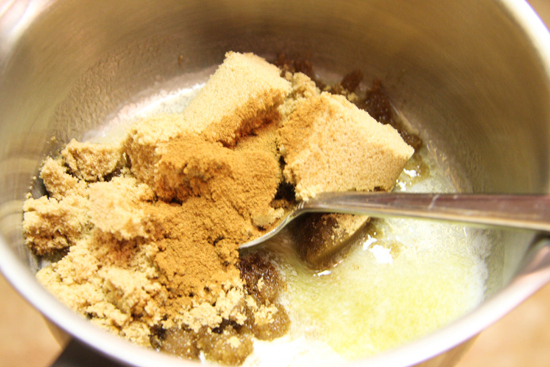 Spread the butter-brown sugar mixture over the dough and cut crosswise into 1-inch strips. Fold each strip in half, and twist several times. Place on parchment-lined baking sheets, cover and allow to rise for 45 minutes. Preheat oven to 375 degrees F.
While twists are baking, combine in a small bowl: 1 1/2 cups powdered sugar, 1/4 teaspoon vanilla, 1/4 teaspoon ground cinnamon and 2-3 tablespoons milk. Drizzle the frosting over the twists while they are still warm and enjoy! 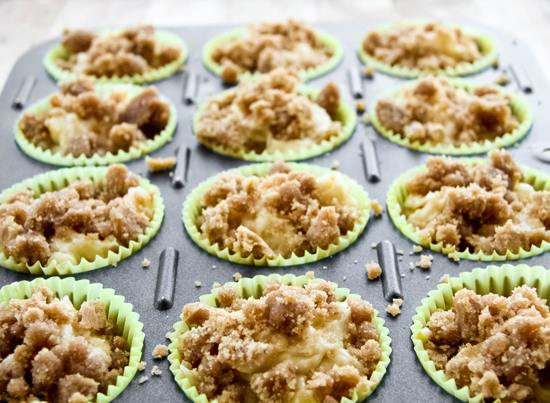 This Banana Crumb Muffins recipe is a delicious way to use up ripe bananas. You will love the crumb topping with brown sugar as an afternoon treat on these tender muffins. So tasty you may want to find friends to send them too! Otherwise be prepared to eat them all yourself! My family's love for bananas is inconsistent. There are times when we go through a large bunch in just a few days. And there are other times, like now, when we are constantly looking at a bowl full of sad, browning bananas that are reaching the end of their life span. Sometimes I get too busy and the bananas get mushy way beyond any worth, so I am left throwing them into the garbage. But sometimes I am able to find a sliver of time when I can throw something together that the bananas can be a part of. My absolute favorite thing to make with ripe bananas are these tasty muffins. They are so tasty that I usually send most of them to work with my husband so I don't eat them all myself! Preheat oven to 375 degrees F. Line 12 muffin cups with muffin papers, or you can grease the cups and forgo the papers. I prefer using papers because it keeps the muffins fresh for a bit longer. Stir the banana mixture into the flour mixture until just moistened. Sprinkle topping over the muffin batter inside prepared muffin cups. Bake in preheated oven for 18-20 minutes, until a toothpick inserted into the center of a muffin comes out clean. And the first thing I always do upon removing them from the oven is put a pat of butter on one and serve it to my 3-year-old because he is always waiting a little too eagerly at the table, ready to devour as many muffins I am willing to give to him. Muffins not your thing? Here is another one of my favorite banana recipes Cream Cheese Chocolate Chip Banana Bread, this recipe is packed with banana goodness and has CHOCOLATE! It's a hit in our house! My absolute favorite thing to make with ripe bananas are these tasty muffins! Preheat oven to 375 degrees F. Line 12 muffin cups with muffin papers, or you can grease the cups and forgo the papers. In a separate, medium bow, combine: 2 large ripened bananas, mashed, 3/4 cup white sugar, 1 egg, lightly beaten, 1/3 cup butter, melted. Stir the banana mixture into the flour mixture until just moistened. 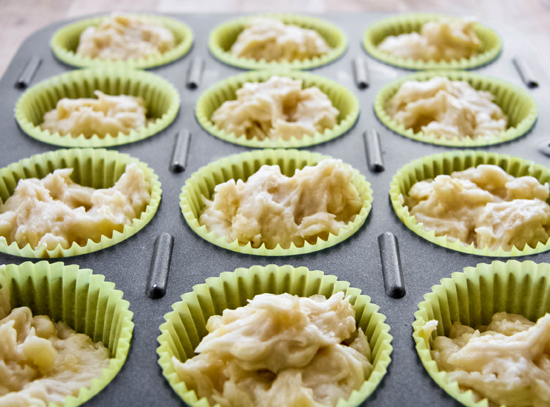 Spoon the batter into prepared muffin cups. In a small bowl, mix together: 2/3 cup packed brown sugar, 4 Tablespoons all-purpose flour, 1/4 teaspoon ground cinnamon, cut in 2 Tablespoons of melted butter until mixture is moist. Sprinkle the topping over the muffin batter inside prepared muffin cups.